Why the REI Trail 40? 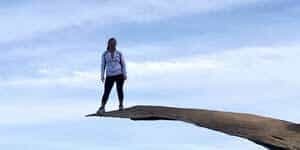 What Types of Hikes Can You Use It On? REI has updated this pack (Sep 2018) and I’m using a different pack now. You can see which pack that I’m using now on my gear page. Here’s the REI Trail 40 out in the wild. 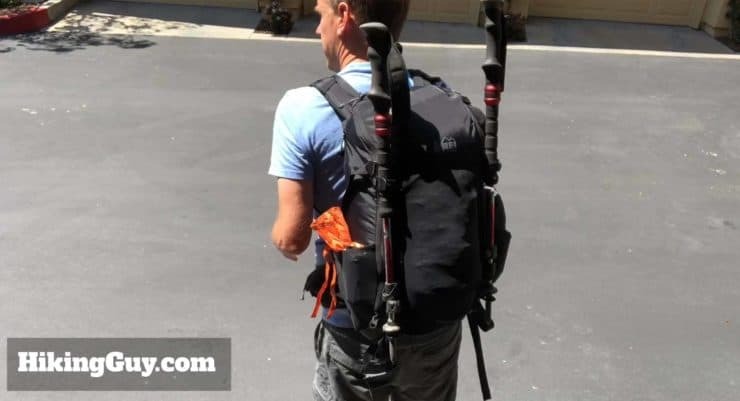 It has everything I need for a great hiking backpack. It can carry all the gear I would need for any day hike, whether a short jaunt or a 20 mile+ hike in harsh conditions like Cactus to Clouds. 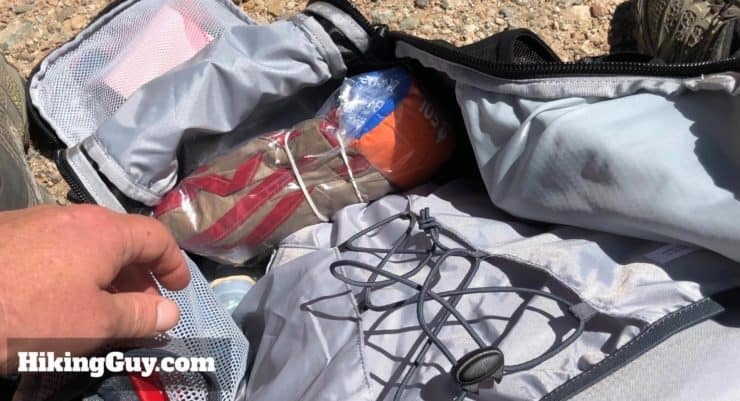 It can hold a 3L hydration bladder and at least two more 1.5L water bottles (like the ones you can pick up at any gas station) for a total of 6L of water storage. It has outside pockets for easy access to snacks, a GPS, etc. 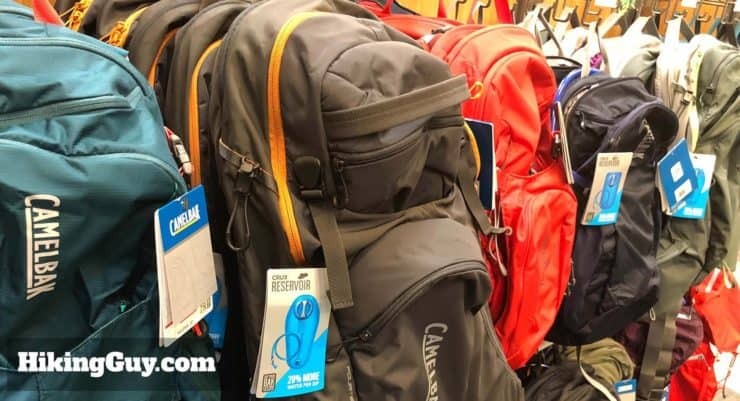 The daypack choices can be overwhelming. I tested a bunch so that you don’t have to. 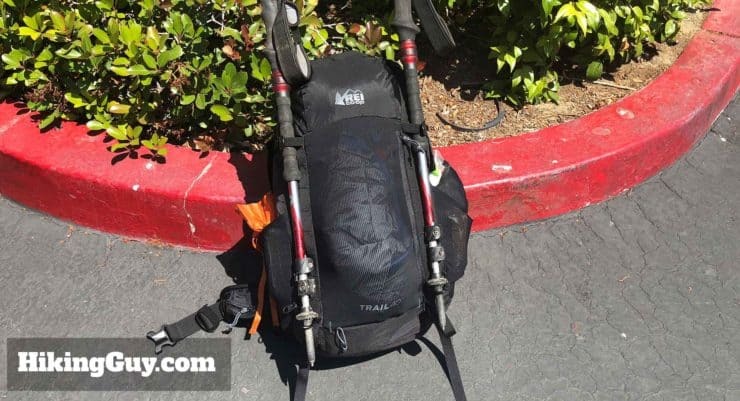 Here are the other packs that I tested and how they compare to the REI Trail 40. 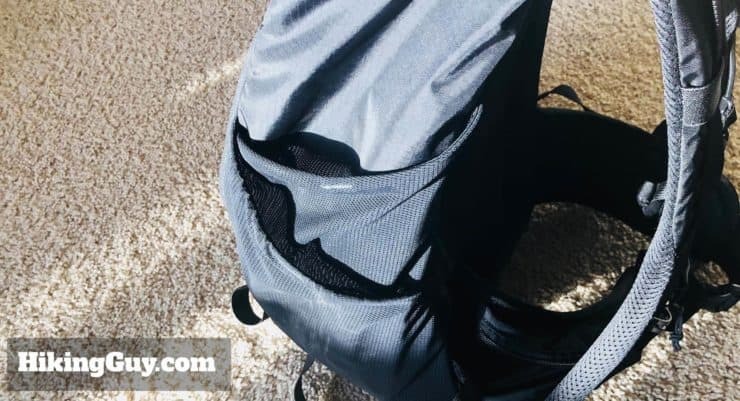 Camelbak Fourteener – I had the old version of this pack and loved it. The new version is a little beefier and has double hip belts. It wasn’t as comfortable as the first version for me, and it has only half the capacity of the REI Trail 40. 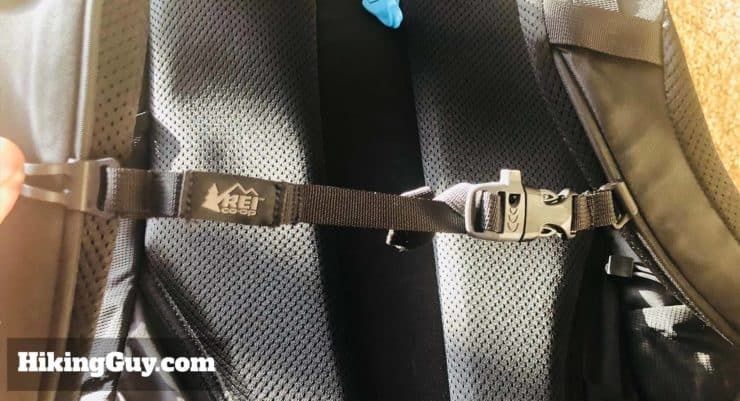 Camelbak MULE – This used to be a great hiking daypack years ago, but they’ve shrunk the carrying capacity to cater to mountain biking, so it’s not a good option anymore. 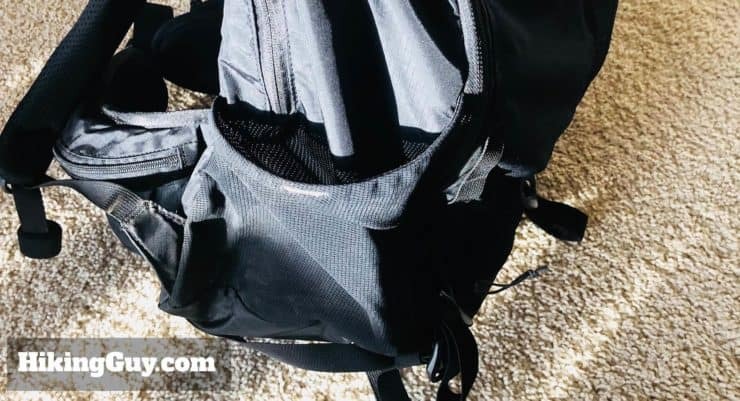 Osprey Stratos 24 – This was one of my first daypacks when I got into hiking and the new model is excellent. It’s comfortable and well thought out. The downside was the size. Even though the published capacity is 24L, I had trouble getting everything for a long day hike in here. And it didn’t have as many outside pockets as I usually like. 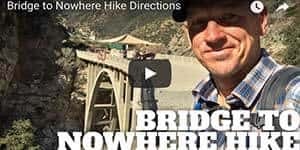 If you’re doing shorter hikes, this is a good option. Osprey Talon 22 – Another good option from Osprey, but had similar problems to the Stratos. There wasn’t enough room for a long hike. I also had a hard time accessing some of the pockets. On the REI Trail 40 I can reach into a good portion of the pockets with the pack on, with the Talon, I had to remove the pack to access the hip belt pockets. The Talon is a decent light-duty pack for short hikes. 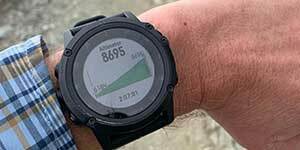 Osprey Stratos 36 – The closest I came to the REI Trail 40 was the Osprey Talon 36, the Stratos 36 was a solid pack. I chose the REI pack over this one because the external pockets worked better for me, especially the mesh pocket that let me put wet gear in it (more on that later). It was also just a little too small for overnight trips. REI products are getting better and better. Take these beefy zippers for example. REI made them a bit oversized so that you can yank and tug the hell out of them and they keep on working. REI gear has been around for a while, but it wasn’t always that great (and depending on what you were looking at). 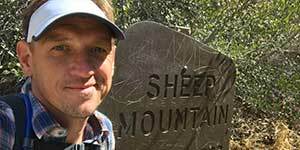 However, in the last few years, REI has been dramatically improving its product line. They evolved the traditional product development process to include people who use the products. 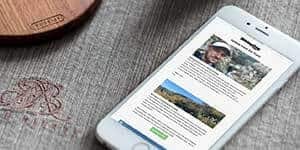 REI recruited their 12,000 employees and thousands of REI members to help them decide what to make and how to make it, working with them to see how they used the gear, what was good, and what could be better. And the results have been excellent. 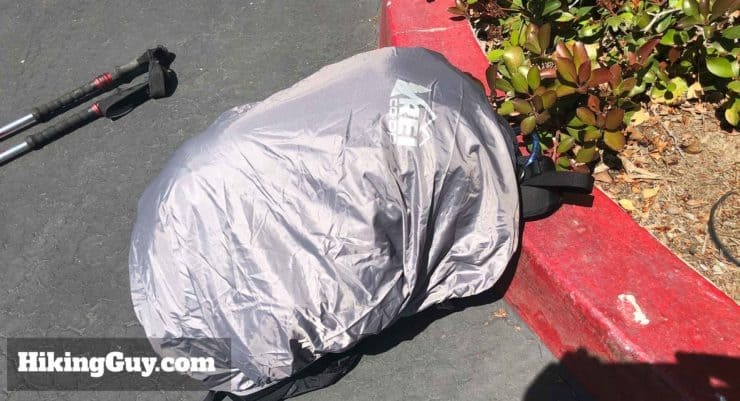 I’ve been testing other gear like sleeping bags, tents, clothing, and larger packs, and the REI options have often been top contenders, if not the best. And they’re generally less expensive than other options (but not necessarily inexpensive). For example, the REI Trail 40 is about 60-70% of the cost of the Osprey Stratos 36. Most daypacks have between 20-35 liters of capacity. 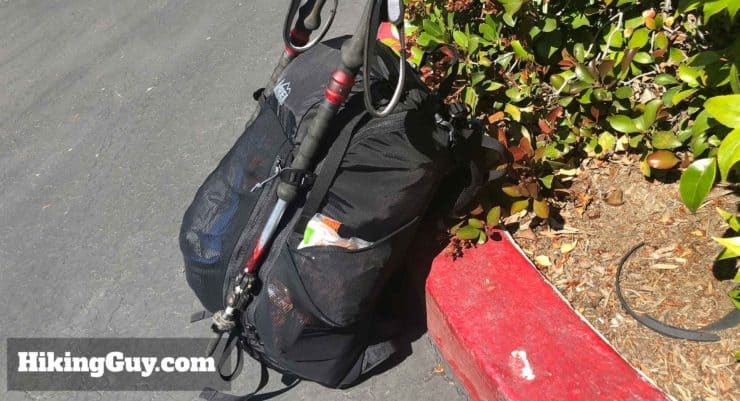 The REI Trail 40 has 40 liters and weights as much as a 20-liter pack. So there’s a lot of room. 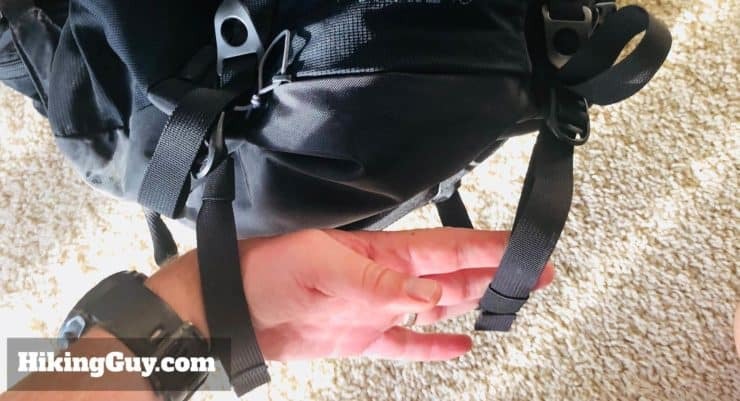 What this means for my everyday hikes is that I never have to get clever about fitting gear in the pack, never have to jam gear in, and don’t have to clip a bunch of gear on the outside when I do a longer (or winter) hike. There is always enough room for whatever I needed. You can fit a ton of gear into the pack. 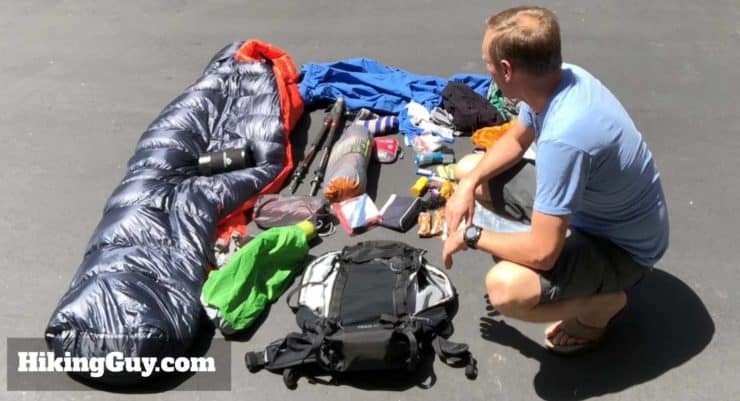 All of this gear (winter bag, tent, sleeping pad) fits INSIDE the REI Trail 40. 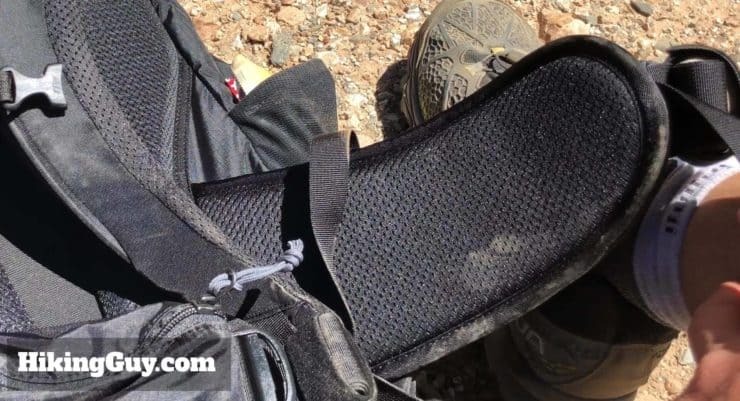 If you have minimal gear the pack can be pretty empty, with the heavy stuff accumulating on the bottom of the pack. There’s a school of thought that you should distribute your heavier gear along the back or on the top of the pack. What I do is pack my heavier gear in stuff-sack and put it in the bungee cord along the back of the back. I also put some heavier gear in the top inside pocket. This helps balance the pack out. 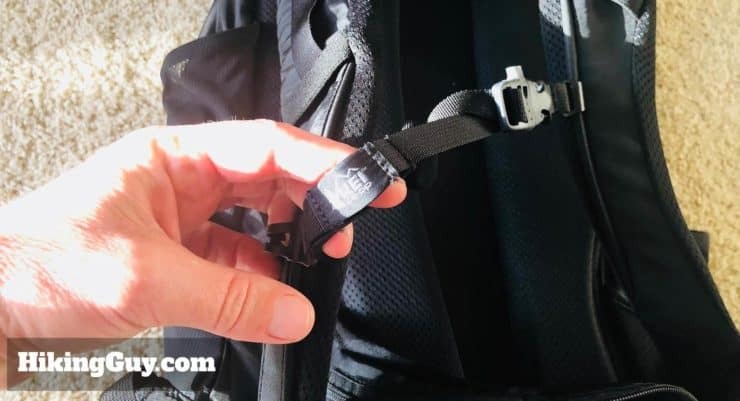 There are no internal compression straps, but a bungee along the spine allows you to distribute gear along the length of the pack. I also use a different pack for really short or easy hikes. If you’re going out for a 2-miler in the local park, this pack will be overkill. In that case, I just used my Flash 22 pack, which is minimal and small. 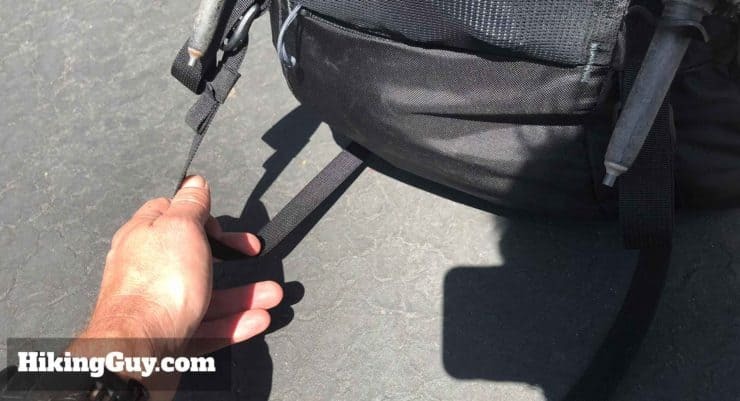 You can carry all of your gear internally for an overnight backpack if you pack right. This shot has all the gear that you see in an earlier image inside it. 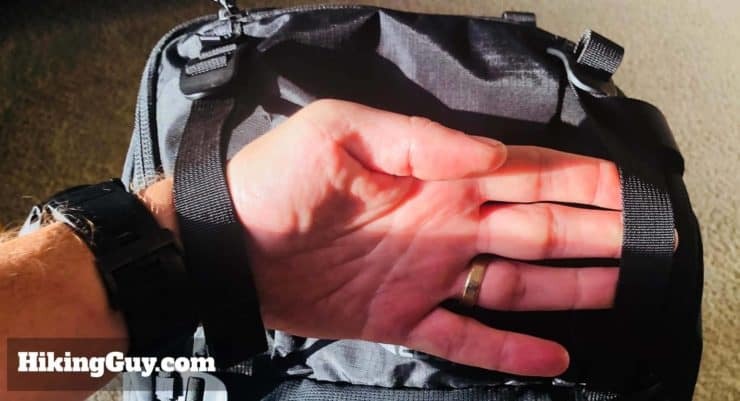 I mentioned that this was a daypack review, and I primarily do day hikes with this pack. But the Trail 40 big enough to do overnight trips as well. It’s not huge, but you can fit a tent, sleeping pad, sleeping bag, and cooking gear inside or inside and outside of the pack. The sweet spot for this pack was a weekend backpacking trip. I had enough room to fit everything I needed. 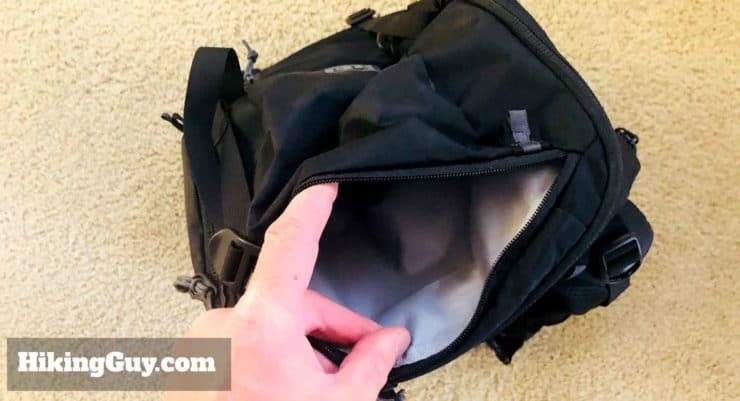 I tend to pack on the light side, so if you carry a ton of stuff with you, you might want to get a bigger pack for overnight trips. Here’s what the pack looks like full. I have a 2 person tent, winter bag, sleeping pad, food, clothes, and other emergency gear all inside the pack. Here’s a view of the full pack from the side. The straps and padding are beefy enough to carry a decent load. 35lbs is about as high as you’d want to go. There’s a pocket on the back of the interior that fits up to a 15″ laptop nicely. 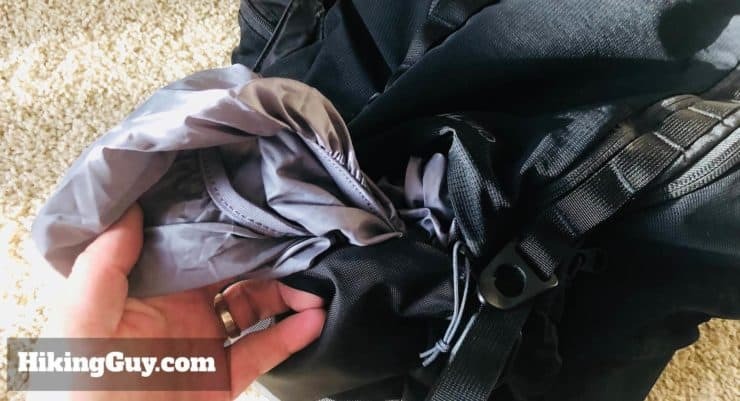 I also use this pocket for dirty laundry and trash on backpacking trips. 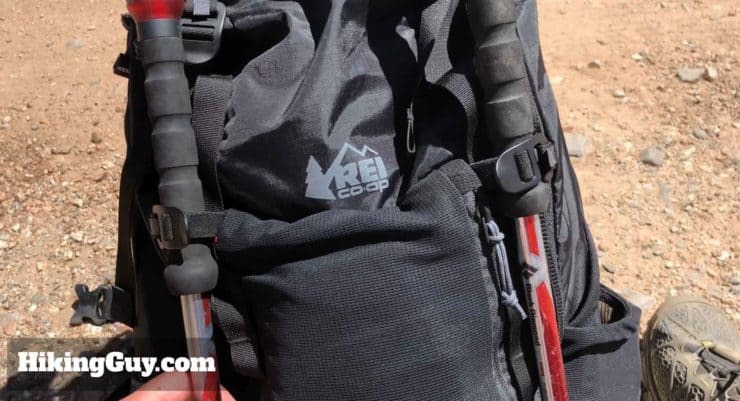 The REI Trail 40 is also a great travel pack. 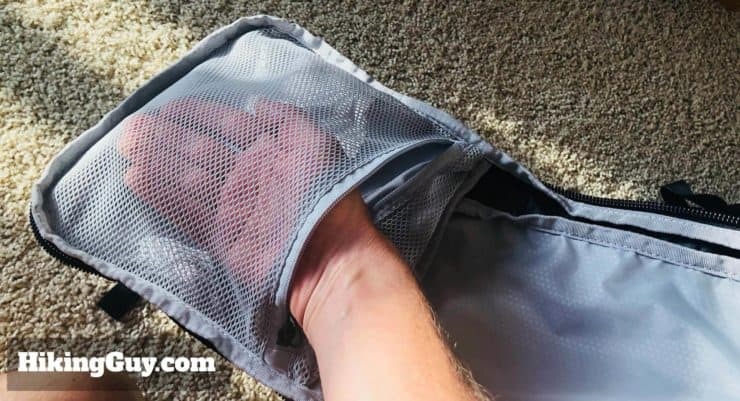 It’s sized to be an approved carryon pack, and there’s a sleeve (not padded) that fits a laptop up to 15 inches. 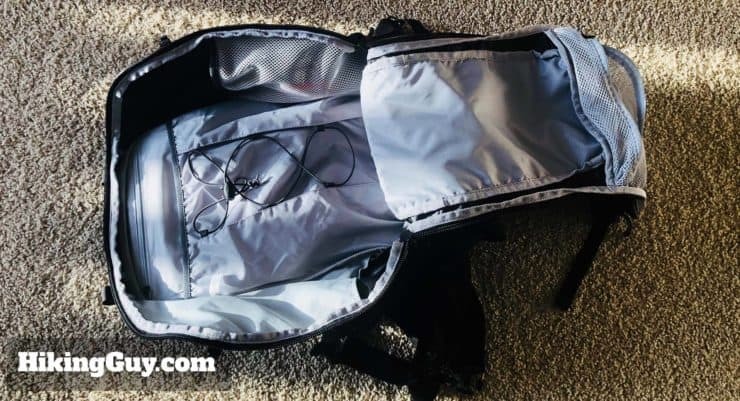 It fits enough clothes and gear for a week of travel, and I used it on a few (non-hiking) trips. I’ve also used it as a carry-on for hiking trips that I needed to fly to. I just pack the Trail 40, bring it on the plane, and then hit the trail with it when I get there. 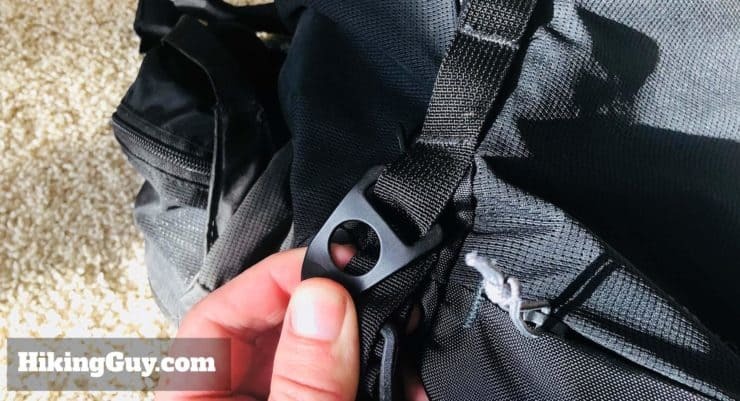 If you do that, just remember to remove any blades or goodies that won’t pass through security.If you hike and travel, using the Trail 40 saves you from having to get two different packs. 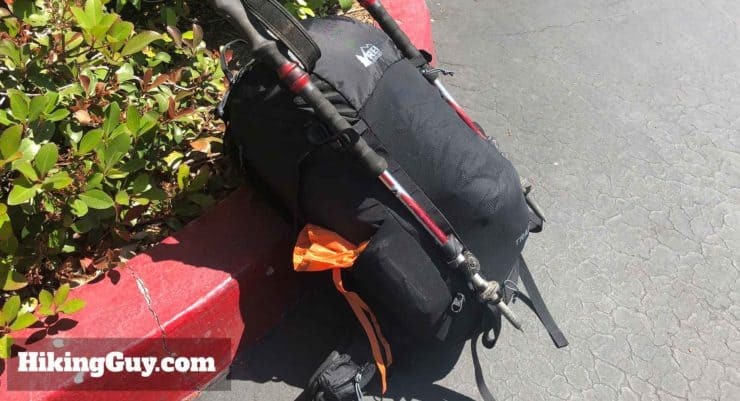 If you’re only looking for a pack to travel with, you might be better served by a travel-specific pack like the Osprey Farpoint 40. Overall, the REI Trail 40 feels like a bigger pack, but much lighter. The padding on the hip belt and shoulder straps is beefy and comfortable. When I first started using the pack, I thought it might be overkill, but after wearing it for a while, it’s been great, especially when it’s really loaded with gear. It weighs 2 lbs 14oz, which is roughly the same (if not lighter) than most of the daypacks that are half its size. It’s light, and this helps to make it comfortable It has a 3mm spring-steel perimeter frame to give the pack structure and rigidity. The padding on the straps is beefy. The back of the pack has two large padding sections with an open channel down the back that lets your back breath. Similarly, the hip pad belts are well padded. 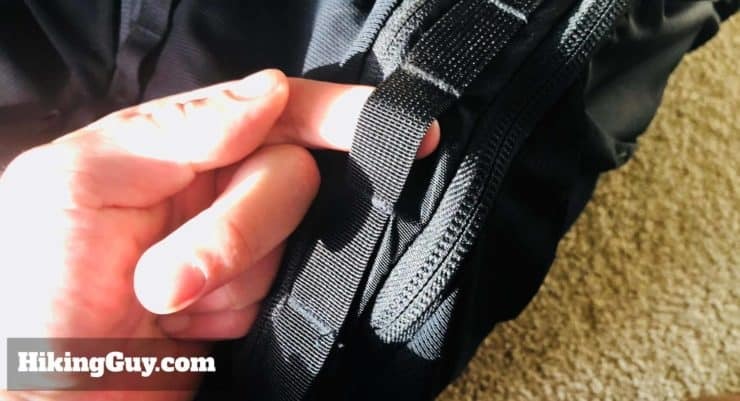 Unlike some other packs, you tighten the hip belt by pulling the straps inward, which is intuitive and easy. The sternum strap can be adjusted by pulling on the strap. It can also move up and down on the shoulder straps to a position that is most comfortable for you. 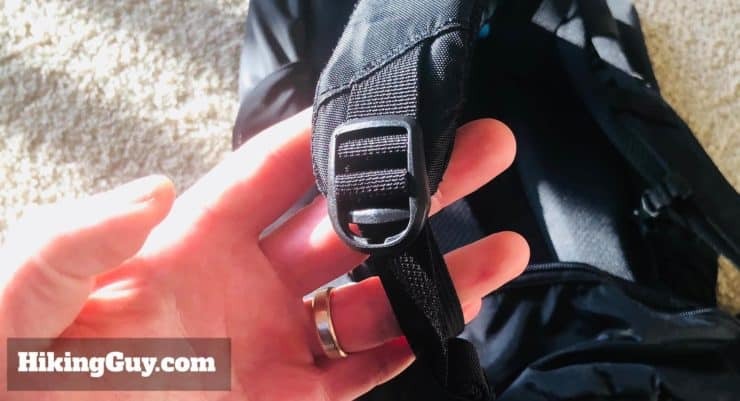 The shoulder straps have two adjustment points. Here’s the bottom one, which tightens by pulling. And then you can adjust the strap from the top too. Being able to adjust the top and bottom lets you customize where the pack sits on your back and adapt to your specific frame. The main compartment is pretty massive and big enough for everything from a day hike to a multi-day hike. I’ve found that 30 lbs is about as high as I go with gear in here before it feels like it’s starting to strain (and gets uncomfortable). REI lists the maximum gear weight at 35 lbs. Here’s the massive main compartment. 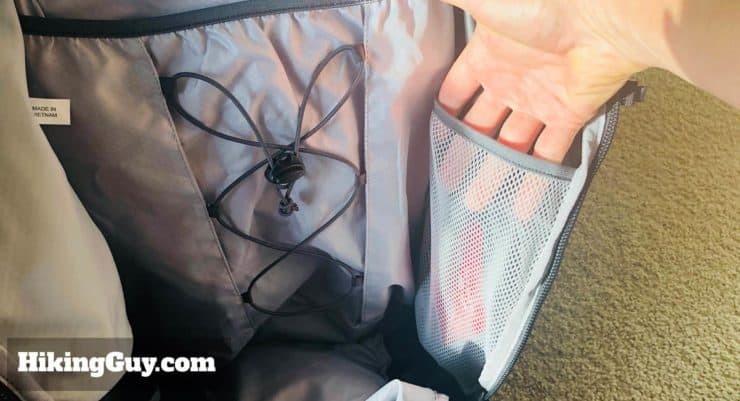 The zipper opens on 3 sides, making it easy to pack, especially if you use stuff sacks or cubes. There are 4 oversized zippers that allow you to get in the pack a few different ways. 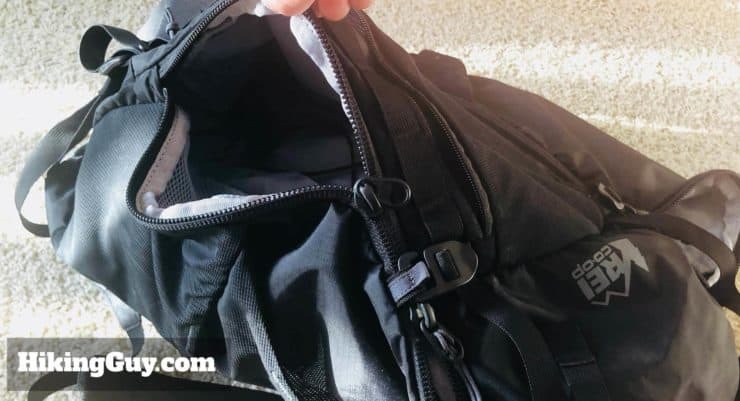 If you do have the hooks over the zipper (so that it opens from the top), you can also access the bottom by unzipping the other 2 (of 4) zippers. 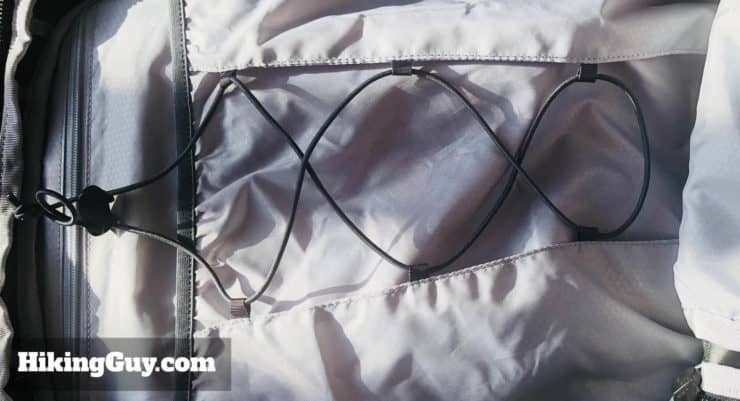 Here’s a detail of hooking the trekking pole clasp over the zipper, allowing you to just open the top. 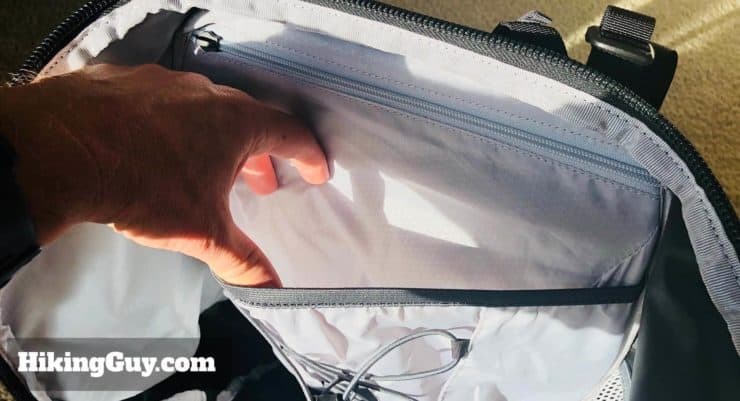 If you don’t hook it over the zipper, you can pull the zipper down all the way and open it up like in the first image, which had all three sides fully open. 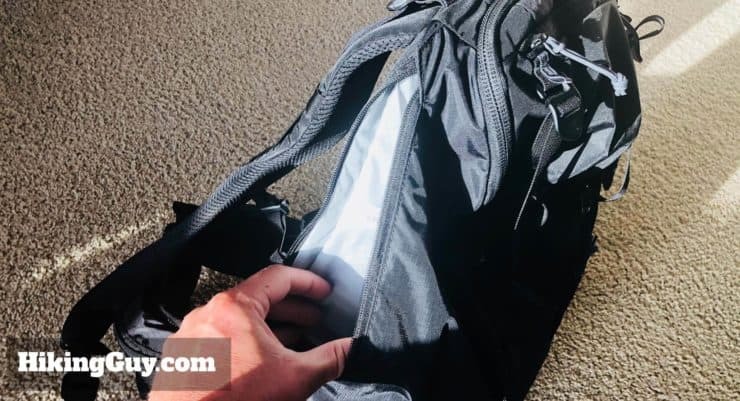 Gear will collect at the bottom of your back, and there are no compression straps inside, but it does have a bungee cord where you can jam your heavier gear in. 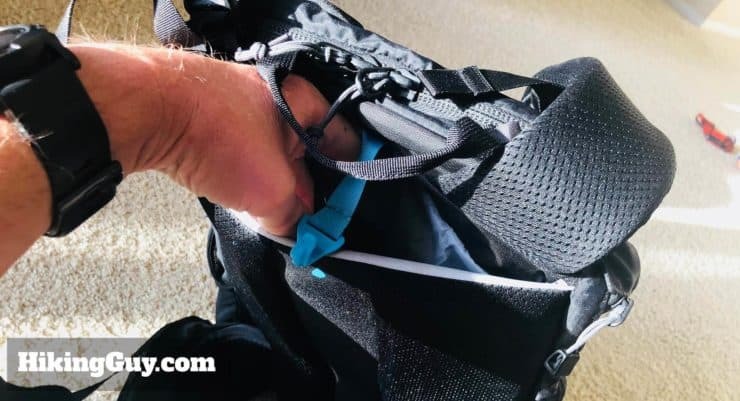 The bungee cord expands and has an adjustment push on the end, allowing you to stuff and hold whatever gear you need along the spine of the pack. There’s also an interior mesh pocket at the top of your pack, on the flap. It’s another good way to put heavier items toward the top if you’re trying to distribute the weight evenly. 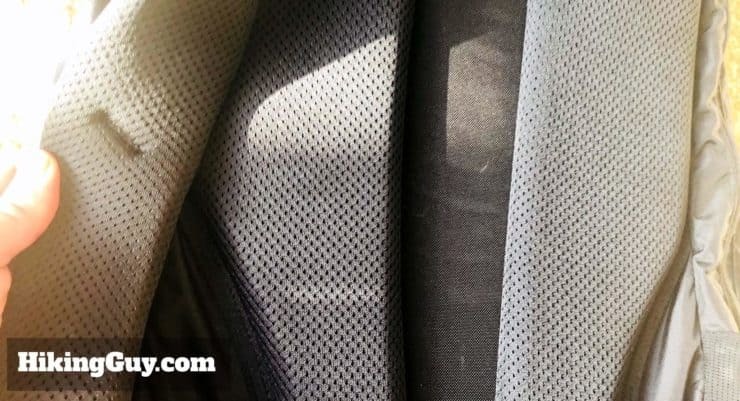 There’s a side mesh pocket on the interior. It’s handy for small items like a first-aid kit. It also holds tent stakes nicely. On the opposite side of that mesh pocket is a reverse pocket. This is great for stuffing tent poles in and keeping them upright. When I pack my tent, I usually take it out of the tent bag and pack the parts separately since it packs better. As I mentioned earlier, there’s a ton of outside storage on this pack. The key to packing it is keeping the things you need handy in these outer pockets. 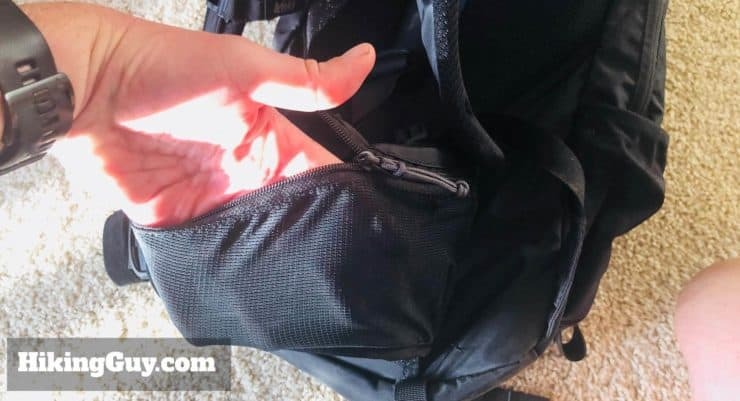 The right side pocket is mesh–you can put wet gear in there. It also fits a 1.5L gas station water bottle or Nalgene bottle. The other side has two staggered pockets, both of which fit big water bottles. These pockets are also handy for snacks or extra layers. 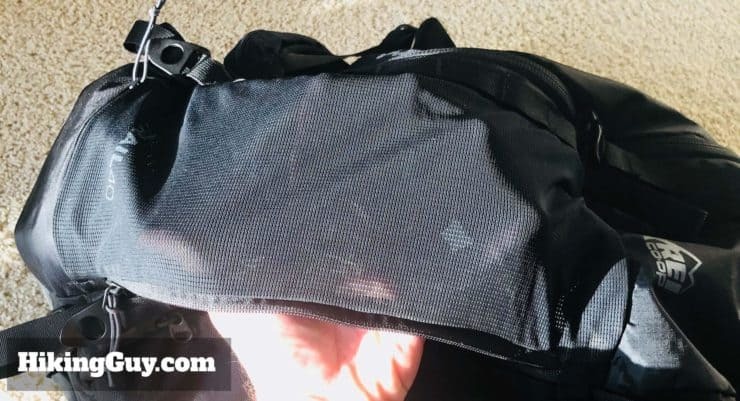 There’s a big zippered mesh pocket on the back of the pack that’s great for wet or damp gear. There’s also a long external pocket on the side. Lastly, there’s a big pocket on top for gear you want to keep handy. I keep my headlamp, a blade, my keys, etc up here. The hip belt tightens by pulling it inwards, which is a smart and practical. Some packs require you to pull backward, away from the pack, to tighten, which didn’t work so well. The hip belts on the REI Trail 40 feel like a bigger pack. 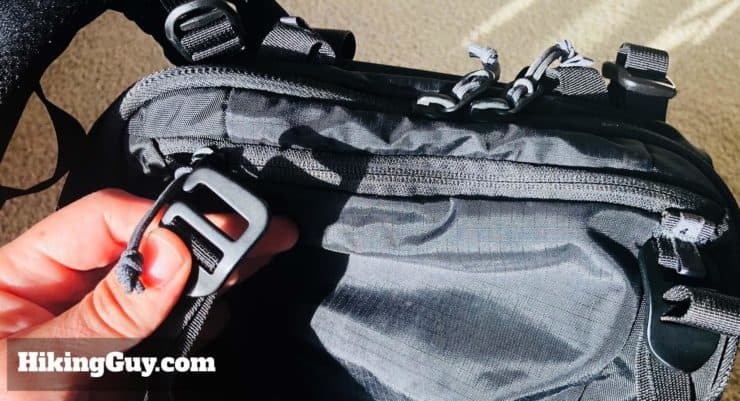 This can be great for support, but usually, I don’t have so much gear in a daypack that I really need the support of a hip belt. So I had mixed feelings here. 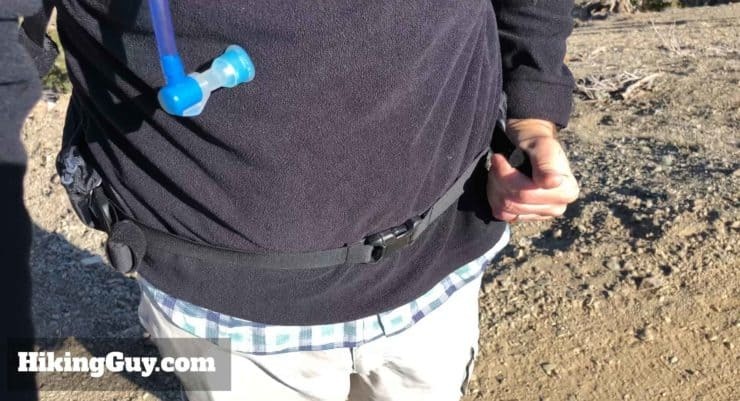 If you don’t want to use the hip belt, you can’t take it off (or tie it off underneath). So you have to use the hip belt. I did get used to always using it, and it’s fine. I like the big hip belt pockets that are openable while you have the pack on. You’d be surprised at how many packs I tried that had the hip belt too far back to open when you had it on. I also really liked the way the belt tightens, which is by pulling outward, not inward. This motion was much easier and gave me a snug fit. And remember, don’t make your belt too tight, you might get bad chafe of your hips. There are pockets on the hip belt too. One side has a mesh pocket. The other hip belt pocket pouch is sealed. Both are accessible when you have the pack on and are great for a phone, tools, or snacks. The only bone I have to pick with this pack is the hydration pocket. 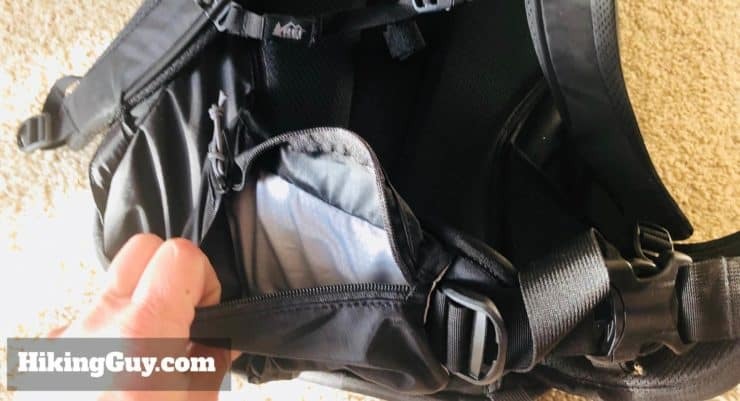 The opening for the top is tight, and when your pack is full and you are putting 3L of water in, it can be tough to get the bladder in. I did figure out how to make it easier, but it took me a while. 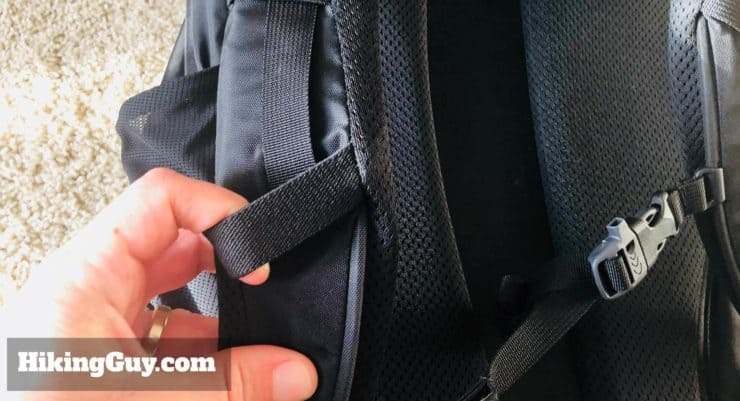 Just lift up (or reverse) the shoulder straps and push back against the pack frame and back panel, which will open the gap up enough for the bladder. You might have to squeeze it in a bit, but it works. Once you get the bottom of the bladder in, just shake the pack and let the weight of the water bring it down. There’s a hook at the top to hold the bladder in place. One the bladder is in, there are clips on the chest strap to keep the tube close. 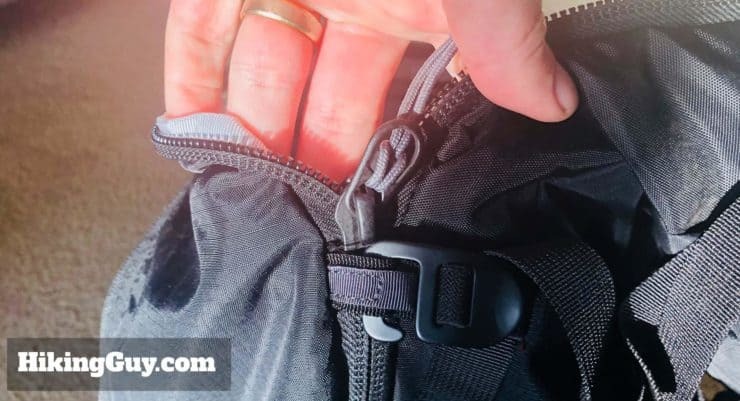 The hydration bladder pocket is on the back, and the pocket that the bladder sits in is separate from the rest of the interior of the pack. You just pull the pocket open, slide the bladder in, and then hook the top onto the blue hook to hold it in place. The good news is that it fits any 3L bladder. I’ve used it with a Camelbak 3L and a Platypus 3L without any issue. It’s really about which bladder you prefer (or which you have laying around). I will say that the Platypus 3L is very easy to fill, open, and close. 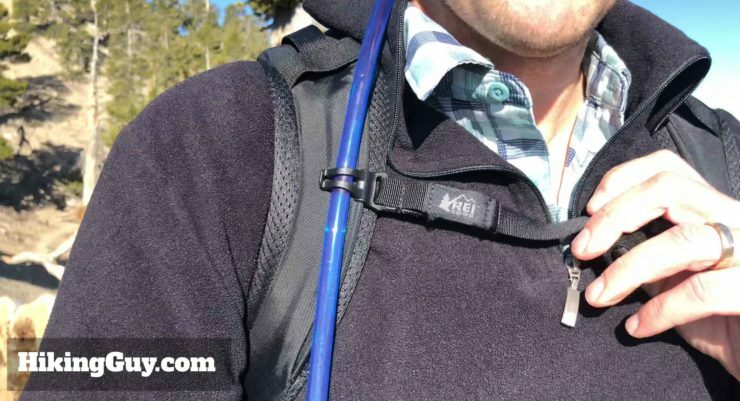 You don’t have to line up the threads perfectly like you do a Camelbak. The Playtpus also fits on the hook nicely. 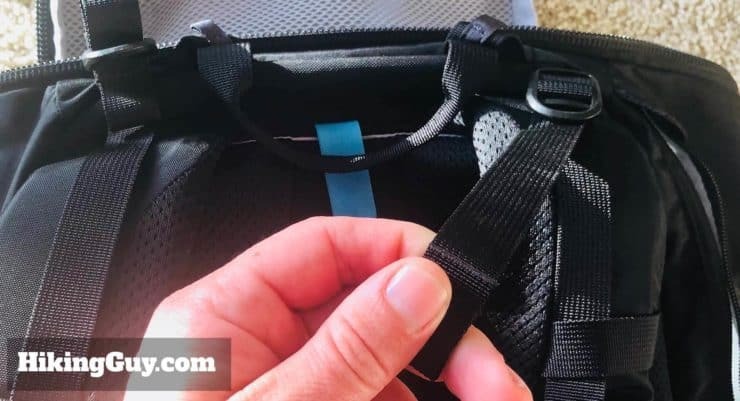 The right shoulder strap has the standard hydration tube clip. 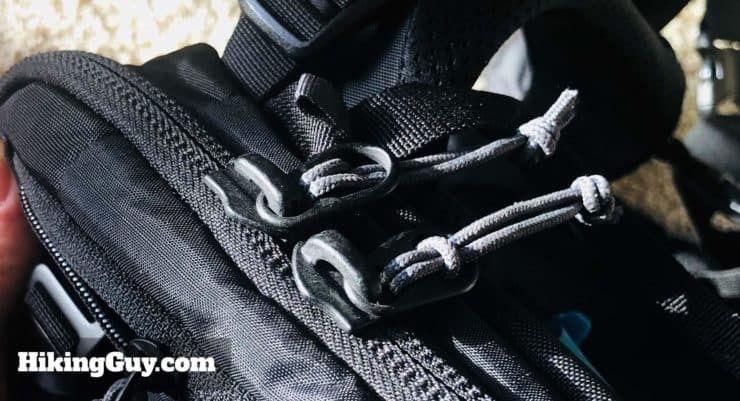 I’m not big on having a lot of gear strapped and hooked onto the outside of my pack, but you certainly have the opportunity to attach gear on the REI Trail 40. The back flap has webbing hooks that you can lash gear onto or clip carabiners onto. There are two expandable straps on the bottom to attach a tent, sleeping pad, or sleeping bag. Here’s another view of the bottom straps with the trekking poles attached. 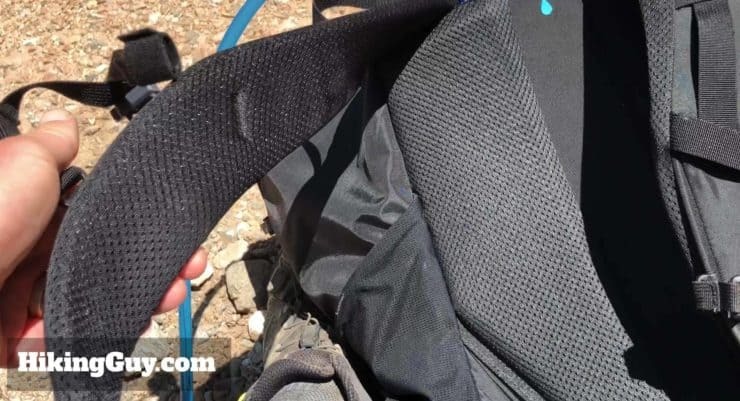 There are also two straps on the top that you can adjust for a sleeping pad, tent, etc. 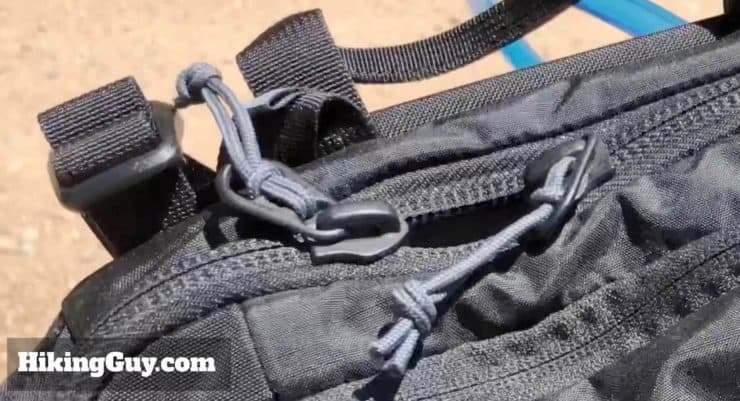 The top straps also have clip-on hooks so you can easily open and close them. 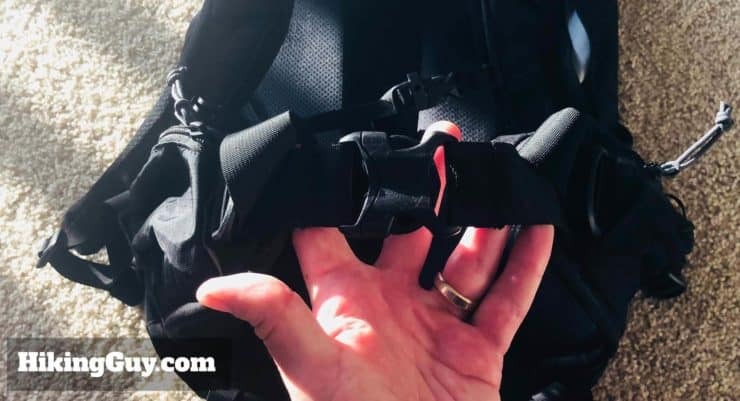 The shoulder straps have webbing that you can clip a GPS or other gear onto. There’s also an area on the sternum strap where you can clip gear onto. The clips that close the zipper off up top (that I showed earlier) are also the trekking pole top clips. You just wrap it around the pole and hook it in to secure the trekking pole. The bottom of the trekking pole goes into these little eyelets. They’re made out of metal, as are the other clips on the pack. 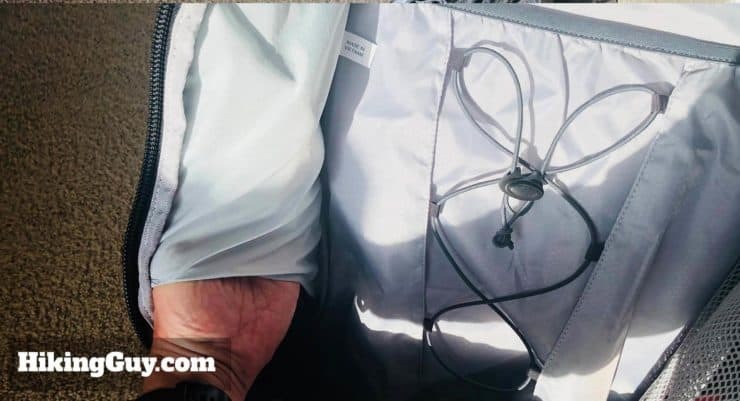 There’s a rain cover stuffed into the bottom pocket. The rain cover is not attached to the pack, so you can use the pocket for something else if you want to. Here’s what a full pack with the rain cover on looks like. When the pack is full, the trekking poles won’t fit under the cover, but when the pack is less full, you can wrangle it over the poles. Not much to say here aside from the fact that it’s durable and I haven’t had any wear problems. It’s made out of 210-denier nylon and has high-quality YKK zippers. I haven’t pampered it and it gets thrown around quite a bit. It’s doing great after 6 months of regular use. Is the REI Trail 40 Worth It? 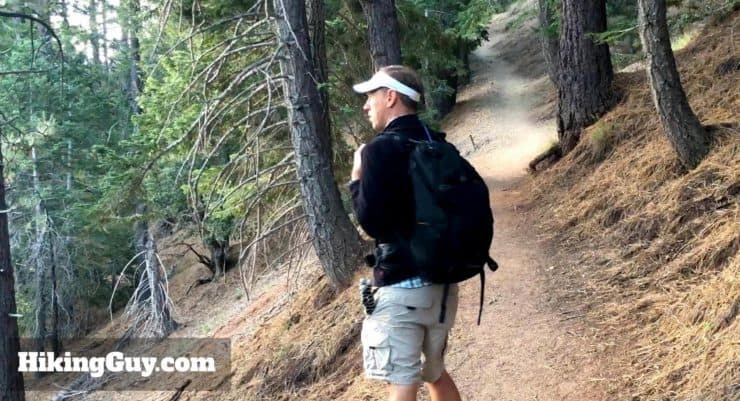 Should you get the REI Trail 40? Yes. Unless you only do really short hikes, this pack will serve you well. 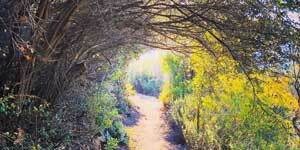 It’s big enough for all levels of day hikes, whether 5 miles, 20 miles, summer, or winter. You can use it for weekend overnights. Some people even use it for extended through-hikes. Every feature is well thought out and has obviously been tweaked and honed by real-world REI testers. It’s super-light and available in a variety of colors, multiple sizes, and custom versions for women and men. And it’s less expensive than the alternatives. It’s hard to find a downside on the REI Trail 40. I’ve been using it for months and it’s great. Give it a try, I think you’ll love it.